I can't find the option to "Copy Course" under the Setting of the course that I want copied. Instead, this is all I see. Please help. Please let me know if you have any questions about this...thanks Irene. What Chris says is very correct but I want to go one step deeper on this. My guess is that you are looking for the button shown below and referenced on the guide page How do I copy a Canvas course into a new course shell? (image below). 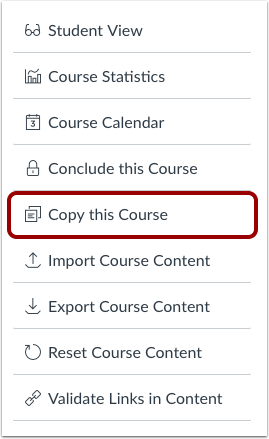 That button will only display for you IF you have access to create courses in Canvas. When you click that button it both creates a new course and then copies content into it. Since you do not have that button visible, your instance of Canvas must not have it set for instructors to create courses. This is actually very common and how the majority of admins set Canvas because they have processes in place to create new courses every term, and it's those course that sync with student information systems for rosters, etc. I think this is why you don't see the button. So now we are back to the answer Chris provided (very accurately and with good links). If a new course has already been created for you go into that course and use the Import Course Content button. If you happen to be a former Blackboard user, I usually tell them that the process is backwards compared to Blackboard. In Bb you push content from an old course into a new one. In Canvas, you pull content from an old course into a new one.